Andy Murray has been among the best tennis players in the world for a few years now. It will be interesting to see if he can take the next step towards the Top3 in the near future. Let’s have a look at his biography and break down his game in detail. The Murray Backhand – One of the best shots in the game! Andy Murray was born in 1987 in Glasgow, Scotland. Like so many pros he comes from a family of sports enthusiasts. His grandfather was a professional football player, his mother is a tennis coach and his brother Jamie is also a professional tennis player! Murray started playing at age 5 and his competitiveness was obvious early on. He probably benefited a lot from competing with his older brother Jamie. Like almost all of the game’s best players, Murray was already very successful in his junior career! He won the 12 and under Orange Bowl tournament which is considered the unofficial world championship. In 2004 he also won the US Open Junior event! His professional career got off to a quick start with a quarterfinal appearance at his first ever challenger event in 2003 at the age of 16! Since then Andy has won 16 career singles titles and has reached three Grand Slam finals which he all lost. His highest ranking was number 2 in the world in August of 2009. Andy Murray is a very smart tennis player. He plays a little different than most of the other top guys on the tour. His game is a bit more defensive but he can also play offense really well. Let’s break down his game in detail! Murray does not miss much! Andy Murray has a strong forehand. Even though his backhand is probably his strongest shot, he likes to run around the backhand and hit powerful forehands especially on higher balls! Using larger muscle groups, the forehand allows to hit bigger shots in general. Andy has a semi-western grip. It seems to me like the index knuckle is on bevel 4. This grip should allow him to hit heavy spin as well as flatter more penetrating shots. He has a great high-low-high and inside-out swing path. He keeps his head very still at contact and uses his entire body to generate a lot of power. Even though Andy has such a great forehand, he tends to be too defensive with it! He does not flatten it out as often as I think he should and generally he does not hit it big enough in certain situations even though he could well do so from a technical standpoint. He seems to be hitting almost solely open stance forehand which explains why he has trouble flattening the shot out. Open stance forehands allow you to hit with more spin whereas hitting with a neutral stance allows you to hit a bit harder and flatter. Andy has one of the best two-handed backhands in the game at the moment! He can hit heavy topspin, he can flatten it out for winners or hit incredible angles with it! It is this variety combined with great technique that makes this shot so dangerous! From a technical standpoint, Andy Murray’s backhand is pretty much flawless. He has great grips, a quick and fluid unit turn, and he manages to hit with a great inside-out swing pattern using his entire body to generate tremendous power! 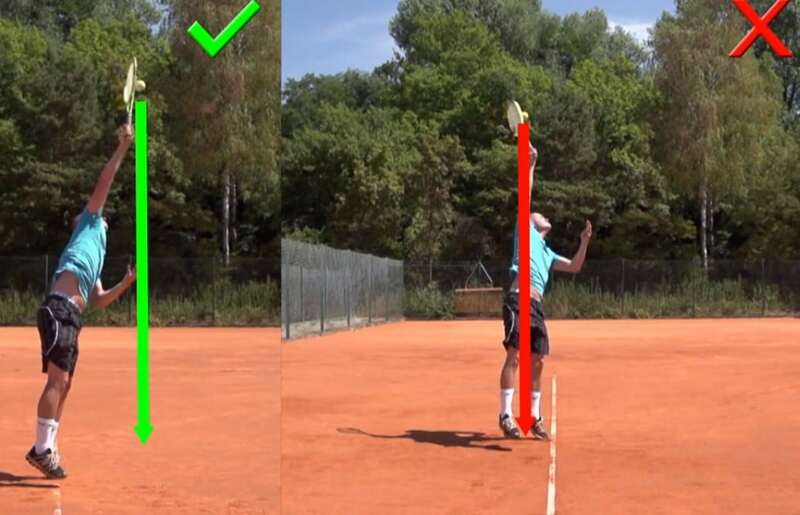 Murray achieves all of the key body positions necessary for a great two-handed backhand! 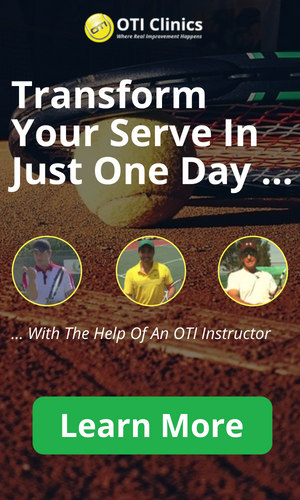 To learn more about the key body positions for great tennis strokes visit the Tennis Video Instruction page on this website! Murray hits a solid slice. He uses it quite a bit when on defense and sometimes he comes in behind it. He is also one of the few players that will mix in slice shots simply to mix up the pace of the rally. Again like so many other pro players these days Andy Murray tends to hit across the ball from left to right a bit too much on his slice shots for my taste. The result is that the slice floats a bit too much and does not have enough bite to it. Andy Murray hits a good forehand volley. He manages to keep the racket head relatively flat at contact and move forward rather than downward with the swing. This way he can generate enough pace on the forehand volley to put opponents under a lot of pressure. Overall his net game is neither really good nor really bad! Murray has a strong serve. I really like how fluid his service motion is! There is absolutely no stop of the racket and he coils and uncoils all the right body segments. His shoulders turn more than his hips. This is called the separation angle and one of the commonalities among great servers! Check out this video of Andy putting on quite a serve performance! Andy Murray has great variety in his game and he can do pretty much anything on the court! He can go on offense and hit winners off either side, he can dominate with his serve, and he is one of the best defensive players in the game for sure. It would be a close call between Nadal and Murray to determine the best defensive player on the tour in my opinion! One of the things that Murray does well tactically is that he mixes up the pace quite a bit. He will hit slice shots where other players wouldn?t and he can go from rather slow topspin shots to instantly flattening out his shots and going for winners. One of his biggest weaknesses though is also on the tactical side! Murray tends to play a bit too defensive at times. This is especially problematic when he plays against the Top 3 (Roger Federer, Rafael Nadal, Novak Djokovic) in important matches. I believe Murray is not going to beat these guys very often in Grand Slams, when they are at their best, unless he starts playing more offensively early on in the rally! Too often does he simply spin his forehand back deep when he could comfortably go for a bigger shot! Andy Murray has become one of the fittest guys on the tour. In recent years people have talked a lot about his gruelling physical workouts with fitness coach Jez Green. Murray has said himself that hard physical work is what got him into the Top5. One of his greatest strengths in Tennis is his phenomenal anticipation and balance! His ability to hit all these incredible passing shots on the run is in large part due to those kinds of physical skills! The mental aspect of the game is probably the area that Andy Murray could improve the most in! Overall he is of course a great competitor; otherwise he couldn’t be ranked as high as he is. The fact though that he has not performed up to his best late in Grand Slam tournaments is a sure sign that he can improve on the mental aspect of the game. The mental aspect here is closely related to the tactical aspect. His tendency not to play offensively enough when it really matters could be caused by two things I believe. Either he has too much fear in important situations, causing him to be a bit too defensive or it is caused from winning too much in the juniors with this game plan! Most likely it is a combination of those two aspects. It was tough to rank Andy’s skills because on one hand he is really good on the tactical side with all his variety but on the other hand his tactics are also holding him back from winning more important matches! I would recommend Andy Murray to practice playing more offensively. He needs to flatten out his forehand more and try to take it to his opponents in those big Grand Slam matches! This will of course be unnatural for him in the beginning and he might lose a few matches doing that but it should be worth it in the long run!